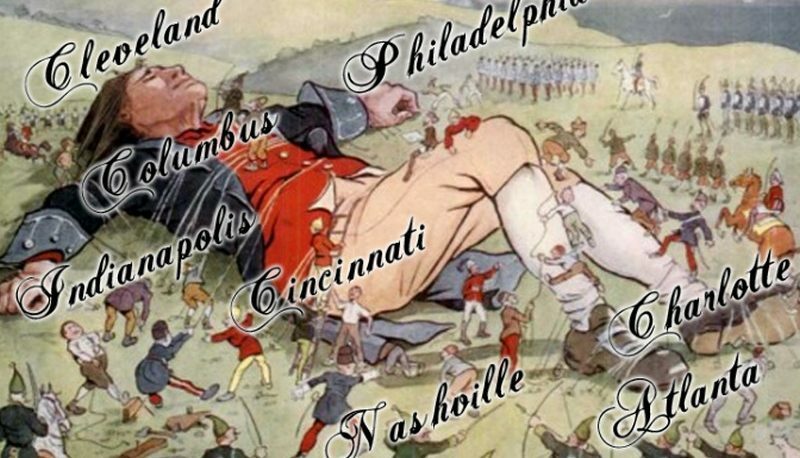 During last week’s POTUS Shield conference in Ohio, speakers made repeated references to a prophecy that Ohio would be the spark for the next Great Awakening, with some citing a “Gulliver” prophecy to explain the selection of cities for upcoming POTUS Shield events. Unclear about how the Gulliver story fit into POTUS Shield’s plans to remake America into the Christian nation of these dominionists’ dreams, I did a bit of googling, which brought me to the website of “The Prophetic Ministry & Resources of Bob & Bonnie Jones with Lyn Kost.” The site recounts the “incredible” Gulliver prophecy given in 2005 by the late Bob Jones, who died in 2014. The next thing Bob saw was a large, center pole of a tent coming up out of Columbus, Ohio. This was His heart. Powerful signs and wonders will come up out of Columbus, greater than we’ve ever seen before, that will look like a canopy over the region. Explosions of miracles and healings will be the hallmark of this city. Cincinnati was the place where the reproduction organs were. Reproducing of the Kingdom will be evidenced here in priestly and kingly anointing. The left hand of this large man was in Philadelphia, which had teaching and great love in it. The right hand extended west and came to rest in Indianapolis, Indiana. It began to flex, and the cords that were around it to keep it tied down, were beginning to snap off like rubber bands. The left foot was in Charlotte, North Carolina, and there was a great television with it, so they televised the gospel all around the world. 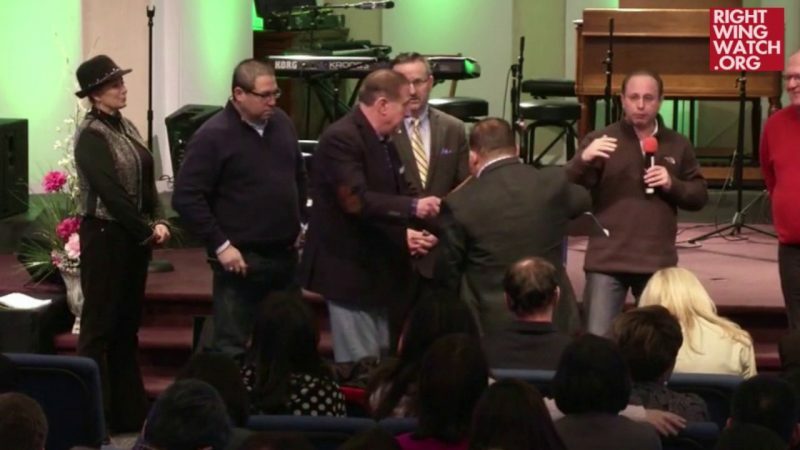 The right foot was in Nashville, Tennessee, where great faith is beginning to raise up. This great man finally began to get up, breaking off all restraints and planting both of his feet in Atlanta, Georgia. Bob said, “God means to take Ohio, then move over to Indianapolis and up into Illinois, crossing over into the east and finally standing completely upright in Atlanta.” The Lord told Bob that to take Atlanta would mean capturing the whole south. 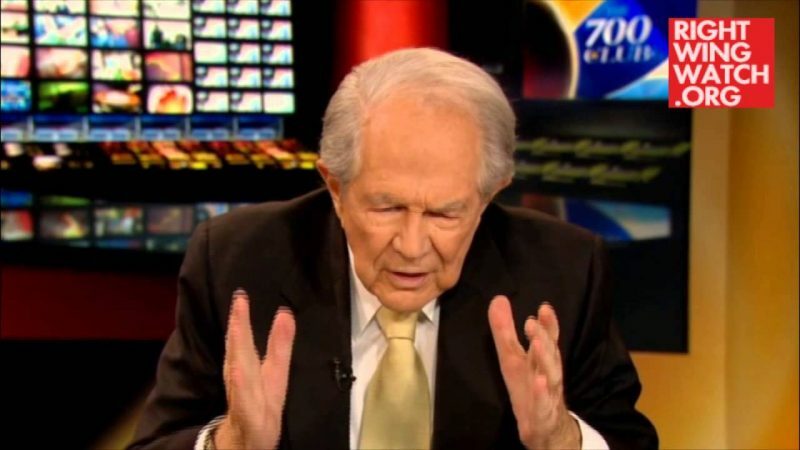 This is not the Bob Jones who founded the famously racist fundamentalist university, but a guy who supposedly met the archangel Gabriel when he was seven years old and was given a mantle as a “Seer Prophet.” Jones’s prophecies played a major role in launching the ministry of Mike Bickle, founder of the International House of Prayer movement in Kansas City. 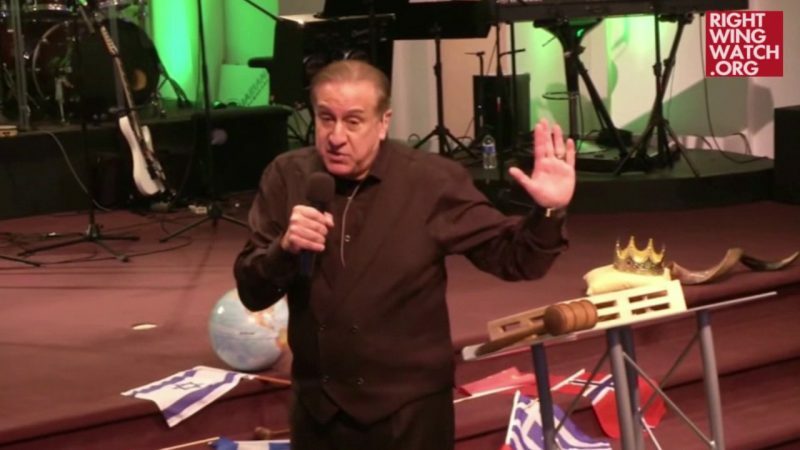 Jones was removed from a Kansas City ministry in 1991 after admitting that he had used his “gifts” to manipulate women and engage in sexual misconduct, but that didn’t end his prophetic career. Jones had a long association with Rick Joyner, a member of the POTUS Shield council, who has called Jones a “legend” and one of the “most remarkable prophetic voices” of our times. Last November, Joyner opened the Bob Jones Vision Center, “a place for prayer, praise, and prophecy,” at his MorningStar Ministries. The prophets of POTUS Shield have clearly decided that the Gulliver prophecy was a divine revelation. There are plans for upcoming POTUS Shield events in Charlotte, which will be hosted by Joyner, as well as Nashville and Indianapolis. POTUS Shield will be partnering with Lou Engle to bring versions of his prayer rallies—branded as “The Call”—to Cleveland this summer and to Philadelphia on Labor Day weekend in 2018, which POTUS Shield leader Frank Amedia noted would be right before the mid-term elections.